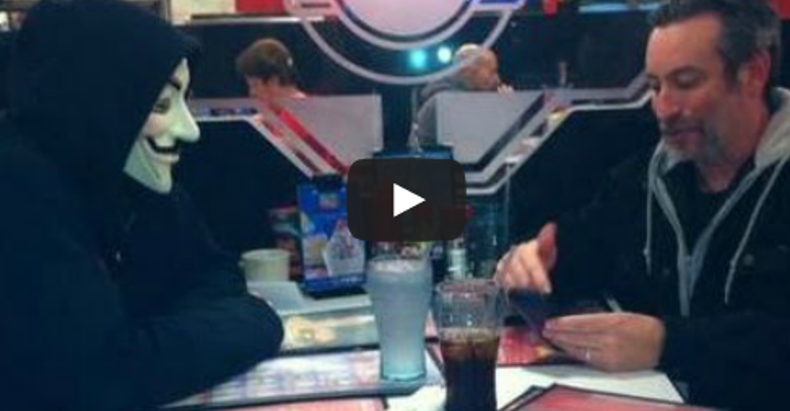 Ferguson, MO — The alternative media group, News2Share has filmed a sit-down meeting between Frank Ancona (Grand Wizard of the Traditionalist American Knights of the Ku Klux Klan) and Alex Poucher, a member of Anonymous. Over the past weeks the two groups have been engaged in a particularly vicious feud stemming from their differences over the shooting of Michael Brown by officer Darren Wilson. After the KKK released a disturbing flyer that said they will use “lethal force” against protesters, anonymous has stepped up to the plate to call them out on this threat. Anonymous answered this apparent call to violence by hacking the KKK Twitter page and exposing many of the members of the KKK in their #hoodsoff campaign. Anonymous also released information, which they claimed, directly connected officer Darren Wilson as well as other members of the Ferguson Police Department to the KKK. Amazingly enough the interview between the two apparent enemies was cordial and may have served to mitigate some of the tension between these two groups. Over the last few days, the hacktivist group has doxed several members of the KKK including Ancona, releasing a deluge of personal information, including social security numbers; so he now knows quite a bit about the capabilities of Anonymous. Apparently trying to take on anonymous group of hackers whose mission is to stand against corruption, has proven to be quite the futile attempt by the KKK. The interview below illustrates that point.